E.ON mis-selling payments: What happens next? Energy supplier E.On is to increase its standard variable dual fuel prices by an average of 8.8% from April 26. The energy giant said its standard electricity prices will increase by an average of 13.8% and standard gas prices will rise by an average of 3.8% "due in large part to increasing policy costs and other costs it doesn't control". Around 2.5 million of E.On's residential customers - 62% - will "potentially" see an increase if they take no action before April 26, the company said. 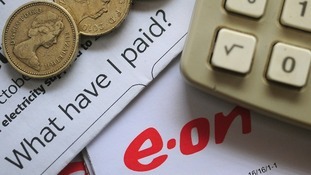 E.On's announcement follows a spate of energy price rises in recent months. Npower, EDF and Scottish Power are among those to have ramped up bills, with many blaming rising wholesale costs. Co-operative Energy is also increasing the cost of its standard variable tariff by an average of 5%. The energy secretary has asked Ofgem to investigate after claims E.ON paid Age UK to push expensive tariff on the elderly. Energy supplier E.ON is to reduce its standard gas price by an average of 3.5 per cent with immediate effect. The company, which has 4.5 million household customers, said the move is equivalent to £24 off the average annual gas bill, or two weeks' gas use. E.ON also launched what it said was the country's cheapest energy tariff, a new one-year fixed dual-fuel product with an average annual price of £923. The move increases the pressure on the other Big Six energy suppliers - British Gas, SSE, Scottish Power, EDF and npower. E.ON UK chief executive Tony Cocker said: "Given the possibility of a price freeze, we are undoubtedly taking a risk today but we always put our customers first." My research today shows that the scandal within a scandal here is that the regulator could not order Eon to pay a penny back to customers. The law would not allow it. The only way the £12 million "penalty" was reached was through agreement with E.ON itself. The law has only just been changed to allow Ofgem to force energy firms to payback - and they are not allowed to use it in cases (like this) where the misdeeds go back years. Ofgem has defended its decision to order energy firm E.ON to pay £12 million to customers, despite the company making an £8 billion turnover. Sarah Harrison, the regulator's senior partner in charge of enforcement told ITV News that compensation was not the only issue at hand, but making the energy market "simpler, clearer and fairer for customers" was also an important factor. Read: E.ON mis-selling payments: What happens next? E.ON has said it will compensate customers it may have mis-sold to. Find out how to make a claim. E.ON boss Tony Cocker has apologised after the energy firm was found to be misleading customers, according to an investigation by Ofgem. While this fine sends a clear warning message that mis-selling won't be tolerated, it's too late for customers who were mis-sold and the damage to consumer confidence in the energy industry has already been done. Energy suppliers should not wait for the outcome of the proposed competition review and must seize their last chance to sort out woeful service standards and put customers first. ?Hard-pressed consumers ?need to be confident that the price they pay is fair. E.ON is just the latest in a long line of energy companies to be found guilty of misleading the public. The energy giants must know that if they mistreat customers already facing a cost-of-living crisis there will be a very heavy price to pay. Our plans will break up the big energy companies, put an end to their secret deals and make tariffs simpler and fairer. The Energy Secretary has welcomed a £12 million redress package, after regulator Ofgem found energy firm EO.N had broken sales rules. Ed Davey said: "It's right that if energy companies aren't fair to their customers, then they're penalised - and their customers benefit. "That's why we introduced legislation to ensure Ofgem can take tough action in these cases, including making the company pay compensation to the people affected."